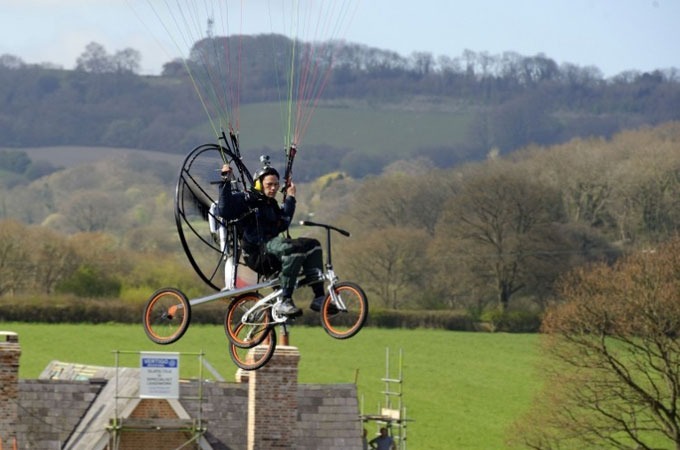 All you need is an alien in a basket to make your biking experience just like a Spielberg film with this crazy flying bike and 13 other highly unusual, sometimes impractical bicycle designs. 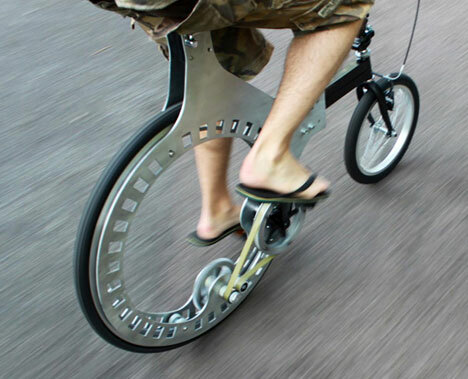 While some are just wild concepts, others represent truly innovative ideas for the future of cycling, from bending frames that function as built-in locks to extremely aerodynamic shapes and chainless drives. 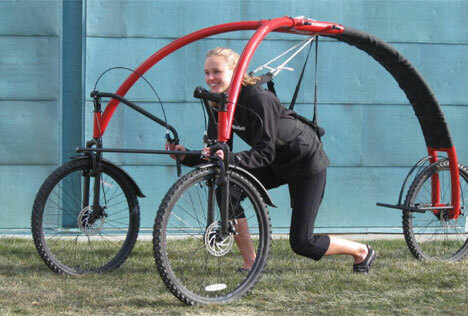 In a surreal scene straight out of ET, this bike can actually be flown right off the ground to an altitude of up to 4,000 feet. 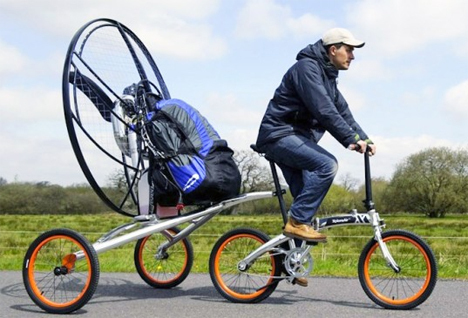 The XploreAir X1 Paravelo flying bicycle is a compact commuting bicycle that can be used like any other bike, or attached to a trailer equipped with a biofuel-powered fan. 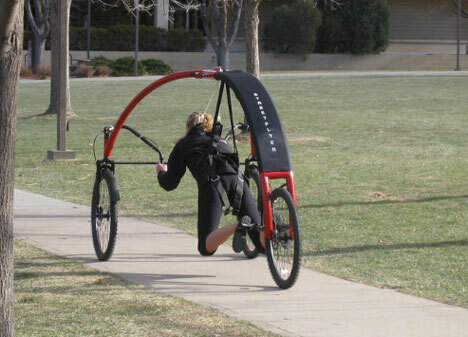 Get it going and the bike will lift into the air with the help of an attached fabric wing, traveling at up to 25 MPH for about three hours until the battery runs out. 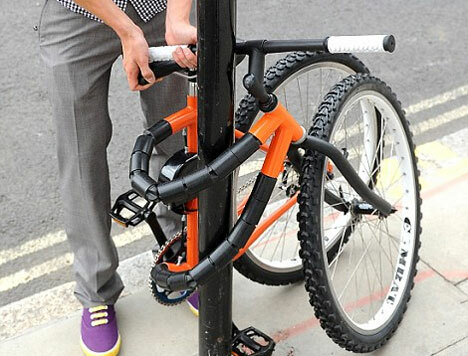 Is this the ultimate theft-proof bicycle? 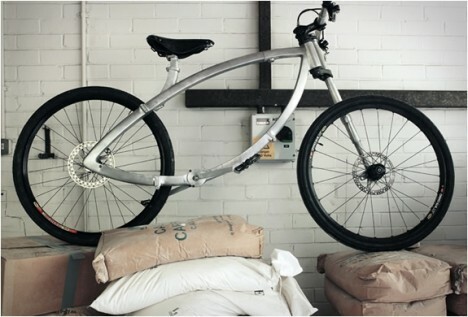 Thanks to an innovative ratchet system, the frame of this bicycle can actually be bent to wrap around a lamp post so it can be secured without the need for a lock or a chain. Ratchet the frame tight again to make the bike rideable in an instant. The bending capability also makes it easy to store. In cities like Beijing, riding a bicycle is a popular and practical alternative to fighting monstrous traffic every day, but then you’re breathing in all of the exhaust from those millions of vehicles. 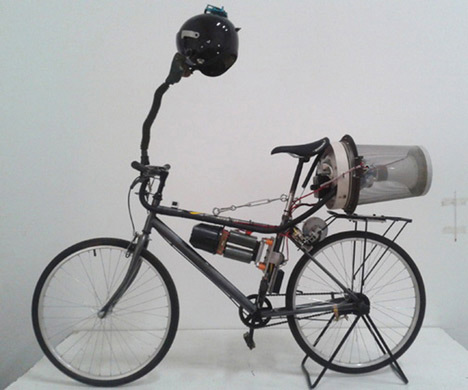 Artist Matt Hope found an interesting if not very attractive solution: a 5,000v air filtration system with a filter that’s powered by your pedaling. The clean air that passes through the filter is then sent through a hose to a fighter pilot mask on the rider’s face. 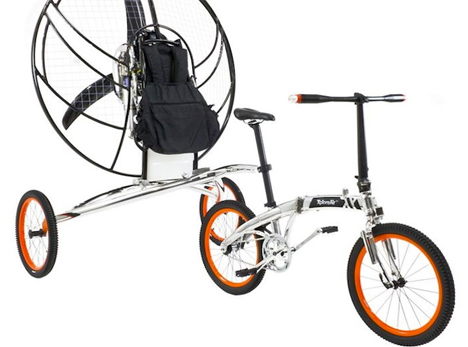 Pretty much the opposite of ultra-compact urban bicycles, the StreetFlyer is a massive three-wheeled contraption that gives you the feeling of flying by suspending you from a lightweight frame using a harness. 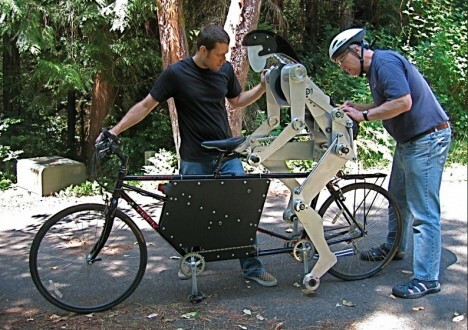 You strap yourself in, get a running start and then use swimming-like movements to pilot the thing. 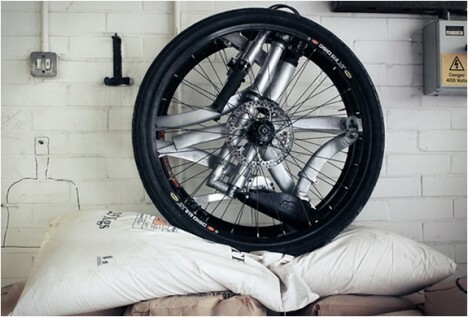 The Contortionist Bike folds from full-size to the size of a single wheel in just twenty seconds. Once it’s folded, you can simply pull it behind you with the handlebars, freeing up your other hand. 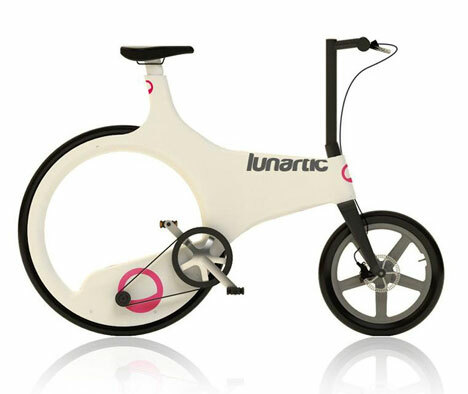 The larger rear wheel and smaller front wheel of the unusual Lunarctic bicycle isn’t purely to give the bike an eye-catching look; it’s functional, too. The larger wheel provides stability, while the smaller one offers enhanced maneuverability. 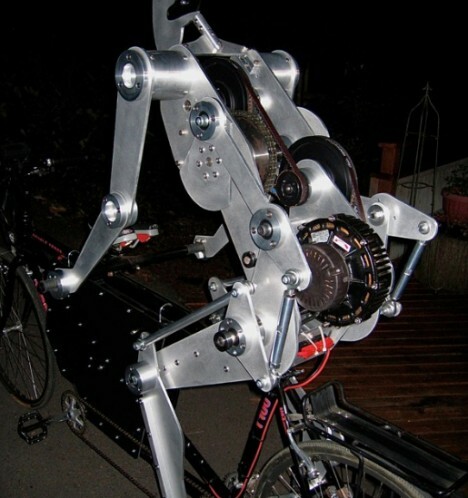 But the truly notable feature of this bike is the lack of a chain, making use of a belt drive instead.